The 1988 sci-fi Japanese animated film Akira gave life to one of the most iconic bikes that remains entrenched in pop-culture 30 years later. Making an appearance again in the recent movie Ready Player One by Steven Spielberg only further reinforces that legacy. 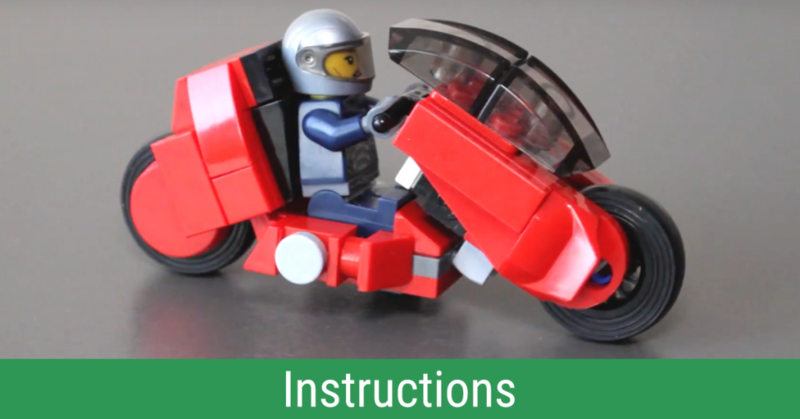 We have Jerry Builds Bricks to thank for sharing a quick build of this amazing bike. There’s no better way to honour this favourite by building your very own miniature version of it. If there really was a theme park with cloned dinosaurs, who do you think would own and operate it? 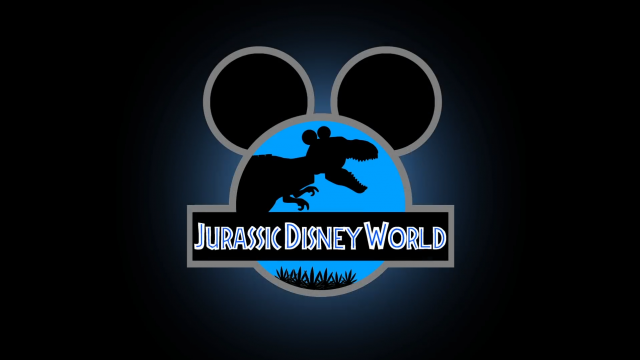 Considering Walt Disney Parks is the world’s largest theme park company and Disney has a history of purchasing competitors, it’s not a huge stretch to imagine a T-Rex sporting Mickey Mouse ears. Paul Hollingsworth and his team at Digital Wizards Studios explore this hypothetical scenario in their clever brickfilm, Jurassic Disney World. Paul and team have done a great job integrating official sets such as Cinderella’s Castle and the Jurassic World gyrospheres with custom builds like Jurassic Park jeeps and a bubblegum tank for Minnie Mouse. Every scene is densely packed with clever gags, impressive animation, and easter eggs (such as a brief cameo by a mutant dinosaur from the short-lived Dino Attack theme). Be sure to watch it twice to appreciate the finer details. 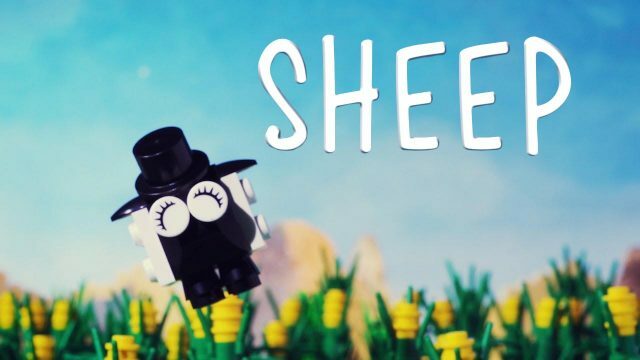 Sheep by Maxime Marion is a cute brickfilm about being true to yourself instead of following the flock. It is also a joyous celebration of the 1×1 round eye tile and its siblings the eyelash tile and the stink eye tile. Maxime creates a wide variety of emotions and expressions using various combinations of these three simple pieces. I would argue that these eye tiles are some of the most important parts added to the LEGO palette in the last decade. Just as the introduction of the minifigure led to a major shift in the scale of vehicles and buildings, the introduction of the eye tile has led to a huge increase in character-focused creations, both in official sets and in fan creations. I hope more brickfilmers follow Maxime’s award-winning example and start incorporating brick-built characters into their films. Watch Sheep below. Wreck-It Ralph was one of those movies that did pretty well and I thought was a great story but somehow wasn’t very memorable in the long run, for me at least. Seeing YOS Brick’s build certainly jogged my mind indeed and reignited some of the memories of Ralph going rogue (aka gone Turbo!) 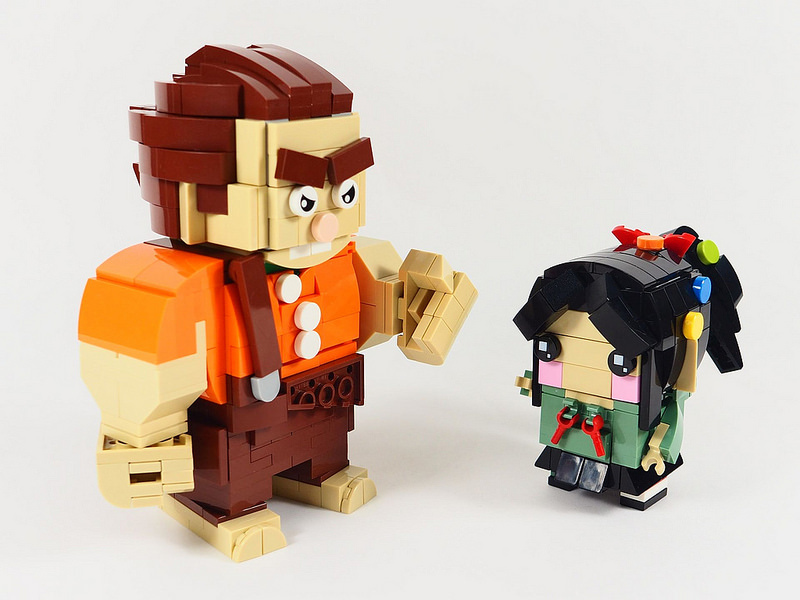 and with the new sequel coming up, we get two of the main characters in BrickHeadz form: Vanellope and Ralph. Well, Ralph isn’t strictly a BrickHeadz; he’s more the appropriate extended form, or to coin a new phrase: a Big Brickheadz, perhaps? The U.S.S. 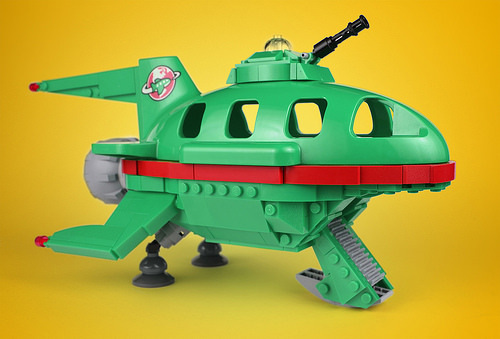 Planet Express Ship is the delivery vehicle for Planet Express Delivery Service in the animated TV series Futurama. In keeping with the creator’s other animated characters, the space ship has a distinctive ‘Matt Groening overbite’. Aido K has managed to make an instantly recognisable LEGO version of the ship using a mix of System and Duplo parts. The key part that captures the shape of the ship is the large Duplo airplane fuselage, and the builder has managed to add in all the other features using LEGO bricks to make this fantastic creation. 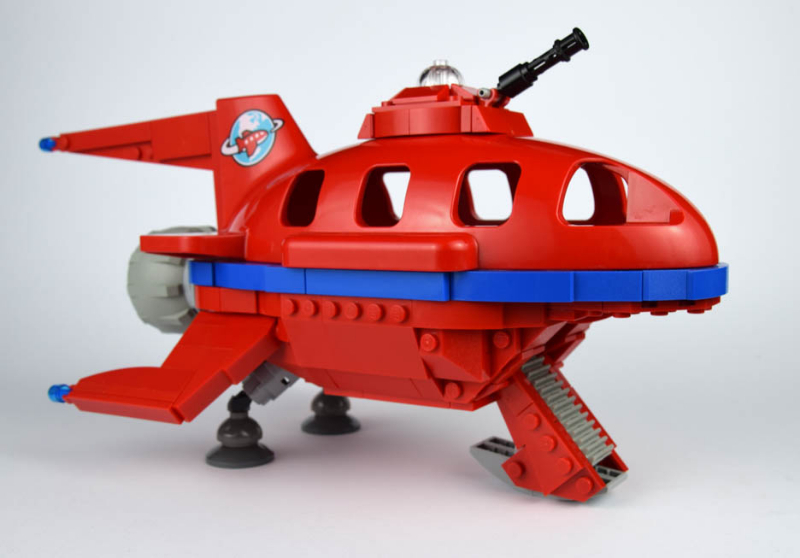 If you know your Duplo parts, then you may be confused about the build above – the upper fuselage part is only available in red. Aido explains the magical appearance of his ship – the build is actually red with a blue stripe and and blue lights and he altered the colour hues in the photograph to achieve a green and red ship! Thanks to Aido for sending the original image as it is a beautiful build in red, let alone after some photo-manipulation to re-colour in green. Recently, Dave Pickett from the YouTube channel Brick 101 created a video for the Argonne National Laboratory called “Chicago Pile-1: A Brick History”. The final product turned out great. Coming in at 2 minutes and 51 seconds, the animation is full of all sorts of thoughtful touches. From the composition of the scenes to the LEGO buildings found within, this is absolutely the work of a maestro. But how exactly did he make it? David’s behind the scenes video gives some insight. If you’ve ever tried to create stop-motion animation using LEGO bricks before, you’ll know it takes a lot of effort. Before you check out the latest YouTube video by BrickBrosProductions (no relation to The Brothers Brick), take a moment to appreciate that it took three days and 1,500 pictures to film their 2-minute animation! Inspired by PESfilm’s stop-motion animations, “Lego In Real Life” is a really cool short film about a boy with a LEGO Movie T-Shirt making his breakfast using LEGO-built ingredients, and the result is fantastic. Keep an eye out for the minifig fridge magnet, the bread turning into toast, and my personal favorite, the butter melting into liquid and bubbling in the frying pan. 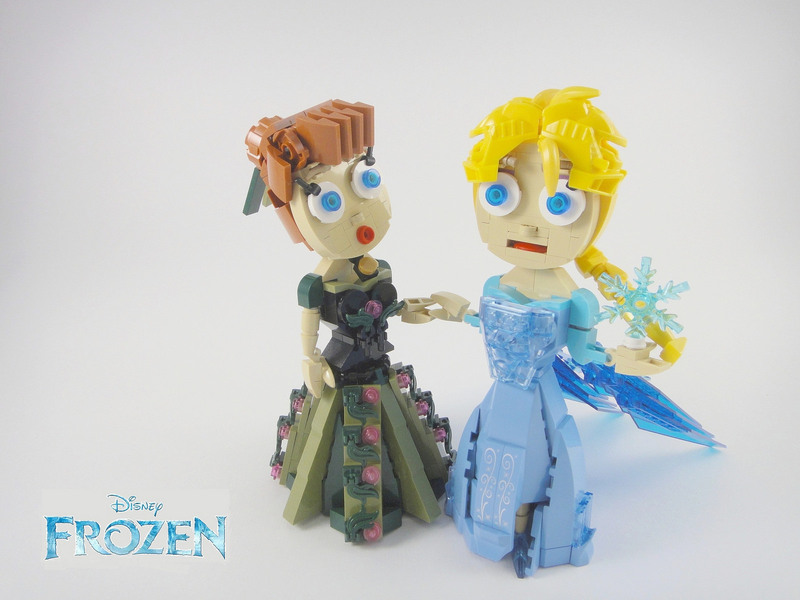 Princesses Elsa and Anna from the 2013 animated movie Frozen have now been immortalised in LEGO by YOS Lego, with a host of ingenious parts used in bringing them to life. The builder has managed to capture those impossibly perfect hourglass figures in their flowing dresses and narrow-waisted bodices using a combination of slopes, wedges and (of course) curves. 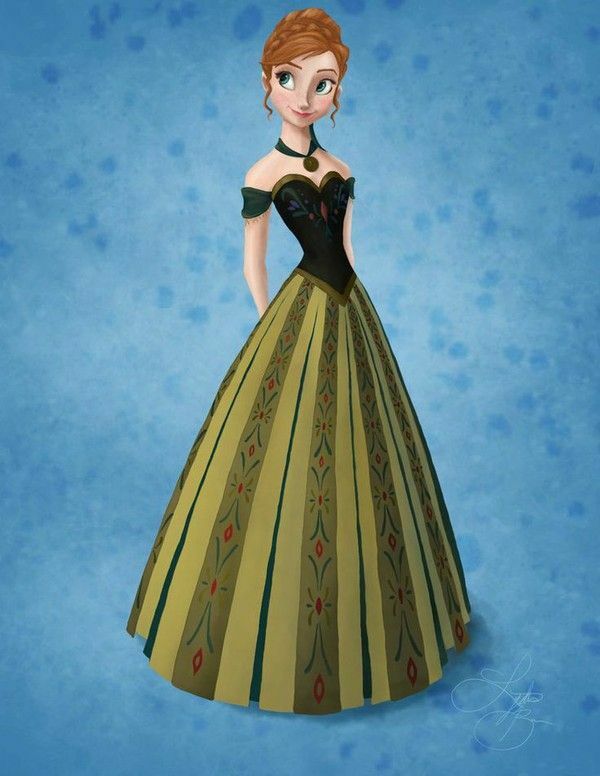 The red-headed Anna figure is fitted out in a beautifully detailed green dress, an amazing likeness to the animated Anna’s green coronation dress. Elsa’s signature windswept, voluminous yellow hair is very cleverly made with bananas and Hero factory masks. The cheeky little bit of leg showing at the bottom of Elsa’s dress, and the more innocent posing of her younger sister, are very fitting. The characters are fantastic, but my only slight concern is that these two princess have either been drinking too much stimulant energy drinks or perhaps Olaf has given them a fright …those eyes are certainly wide and piercing! 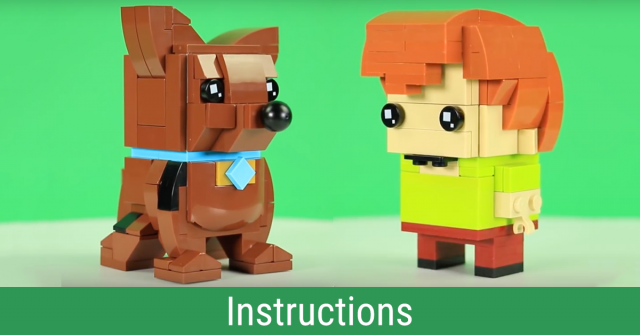 It’s not often we get to present LEGO animation! If you’re looking for a peaceful way to spend some time this afternoon, I invite you to watch Jim Wright‘s animated Ninth Symphony, composed by Ludwig van Beethoven. Not only was Rhino a huge truck, but it also formed a mobile defense unit with cannons, a battering-ram bumper, and a missile launcher. The builder has managed to capture all these great additions in his LEGO version. 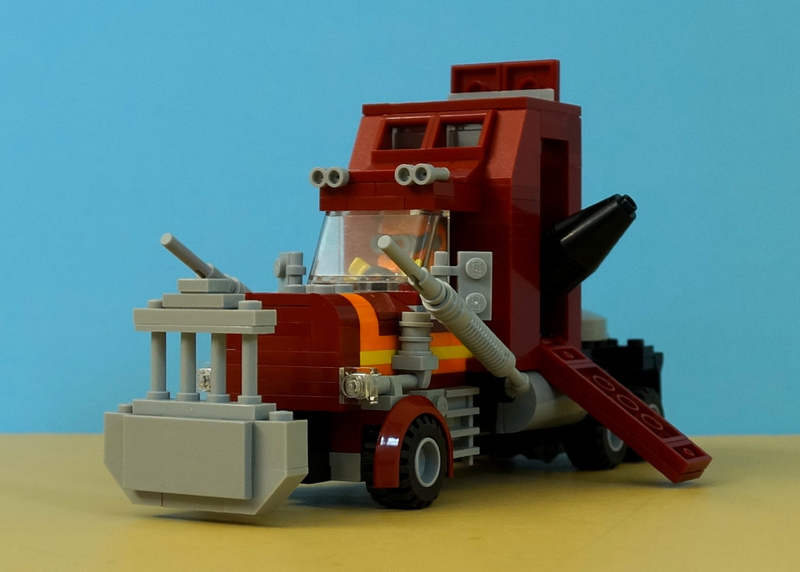 Hobbestimus has a few other M.A.S.K builds and closer views of these vehicles in his Flickr M.A.S.K. album. After the Creator Islands mobile game released back in Fall 2014, here comes a new themed app — the Creator App. This time it’s not just a game, but a number of digital activities for kids. The app features a monthly building contest (the current one is about racing accesories), a number of videos with building secrets and ideas, and a stop-motion studio, which allows the creation of simple videos up to 75 frames (~20 seconds) in length. Assuming the interface is extremely simple and freindly, the app might become the first stop-motion animation experience for many children. The LEGO Creator App is availiable for both iOS and Android.